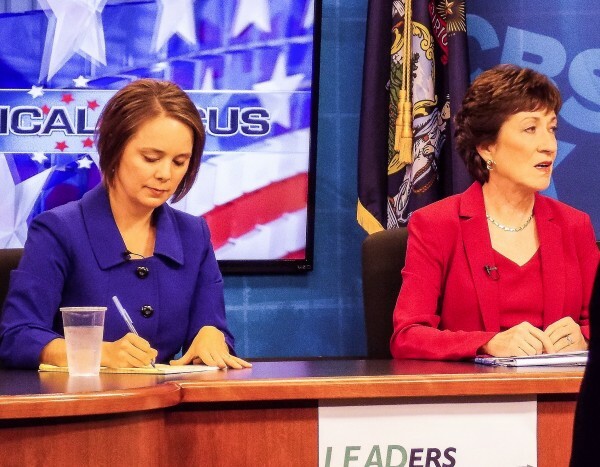 Democratic U.S. Senate candidate Shenna Bellows (left) and incumbent Republican Sen. Susan Collins consider questions posed to them during a debate on Monday in Presque Isle. 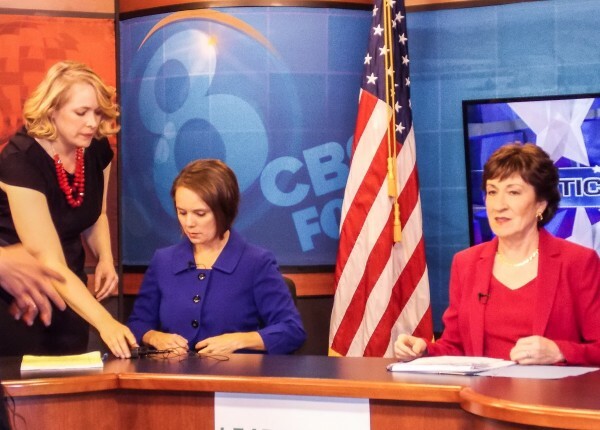 WAGM News Director and co-moderator Kelly OMara (left) helps Democratic U.S. Senate candidate Shenna Bellows, as she and incumbent Republican Senator Susan Collins prepare for a debate on Monday in Presque Isle. PRESQUE ISLE, Maine — Though they found some common ground on veterans’ benefits and public education, U.S. Senate candidates Shenna Bellows, a Democrat, and incumbent Republican Sen. Susan Collins remained divided on raising the minimum wage and providing universal health care during Monday night’s debate in Presque Isle. The locally televised debate was the first of several for the two in the lead-up to Election Day. It was co-hosted by WAGM-TV and Leaders Encouraging Aroostook Development. Moderated by WAGM News Director Kelly O’Mara and Leaders Encouraging Aroostook Development board member Jason Parent, the live session saw the candidates wrangle with a variety of previously submitted questions facing the state and the nation. Among the most divisive issues was raising the federal minimum wage. While both support boosting the federal rate of $7.25 per hour (Maine’s minimum wage is $7.50 per hour), Bellows concurs with President Barack Obama’s suggested $10.10 per hour, while Collins would like to see a more modest and gradual increase. “I am concerned about an increase that large and its effects on small businesses,” said Collins. Some small businesses may not be able to afford that hike, she said, which could in turn lead to about 500,000 jobs lost. “I think a gradual increase makes more sense,” she said. Collins cited discord over the minimum wage as an example of how a unilateral proposal such as Obama’s on the minimum wage leads to gridlock on Capitol Hill. “This is what’s wrong in Washington today — only one proposal gets considered,” said Collins. Bellows responded that raising minimum pay the full $2.85 would amount to just over $21,000 per year. “Congress members who make $174,000 a year and don’t support $21,000 for working families — that’s what’s wrong with Washington,” she argued. The two also split on health care, with Bellows favoring a universal plan similar to those offered in Canada and many European nations. On the question of affordable energy, both agreed more federal work needs to be done to support alternative energy sources. “The federal government should increase investment in solar, geothermal, tidal and biomass,” Bellows said, adding that she favors lowering taxes for consumers. The two sparred on several policy issues, including economic development, support for charter schools and even Maine’s upcoming referendum Question 1 on whether or not to ban bear hunting via baiting, trapping and the use of dogs. Collins gave a nod to the state’s hunting tradition, too, but she refused to state a public position on the question. “I am not going to tell the people of Maine how they should vote on an issue,” she said. One question from the moderator called economic development initiatives an ongoing failure and asked candidates how they would improve state development efforts. She referred to her walk across Maine and meeting many residents in need of jobs, with some jobs outsourced to other countries. “We need to stand for our workers and our communities,” she said. Collins said workforce training is key. She defended her work to support the Defense Finance and Accounting Services and the Maine Military Authority in Limestone, among others. “Remember that the mainstays of our economy are agriculture and the forest products industries,” she said. The candidates found common ground in their support for public education and veterans’ benefits. Considering whether to support charter schools or to make public schools better, both praised their public educations. The two also favored stronger veterans’ benefits, noting family members’ service. Bellows said more work needs to be done. The candidates also agreed that the nation was ill-prepared to deal with the Ebola virus, and the two stated opposition to the idea of locating a nuclear power plant in Maine. Collins recalled her efforts to save Defense Finance and Accounting Services, expand the National Weather Service office in Caribou and return potatoes to school nutrition programs. “These are just some of the projects I have worked together with you on, and I ask for your vote in November,” said Collins. The candidates will meet again in four other televised debates: 8 p.m. Oct. 22 at Husson University in Bangor, televised by MPBN; 7 p.m. Oct. 23 on WMTW in Auburn; 5:30 p.m. Oct. 27 on WGME in Portland, co-sponsored by the BDN; and 7 p.m. Oct. 29 on WCSH in Portland.